Do you want to make your business look more high-end? You could spend a fortune updating the interior of it, but if it still looks boring on the outside, will you really draw in the customers that you’re looking for? Instead of simply focusing on the interior of your business, consider installing architectural awnings outside. 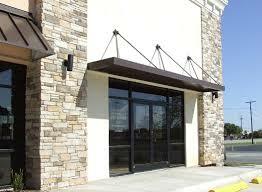 Many modern awnings are designed to make stores look more elegant and inviting. Whether you decide to go with metal awnings around the entire exterior of your shop or front window or door awnings that will welcome people to your store, you will love the way your entire business looks when you have architectural awnings installed. Awnings will instantly improve the exterior aesthetic appeal of your business and help your brand get the attention you’re looking for from prospective customers.